Two police officers opened fire on an auto-theft suspect Friday, missing her, as she drove a pickup truck directly toward one of them on a Barrio Logan street, authorities reported. 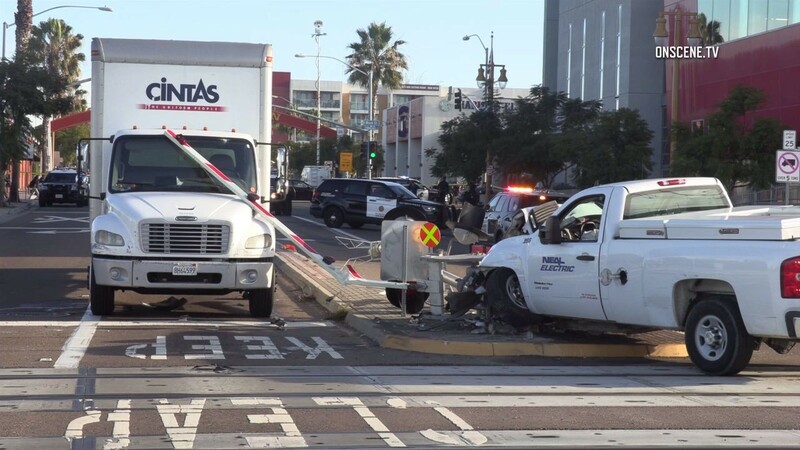 Moments after Friday morning’s non-injury shooting in the 1300 block of Sampson Street, the suspect crashed the stolen Chevrolet Silverado into a trolley signal pole at Harbor Drive and Cesar Chavez Parkway and was taken into custody, SDPD Capt. Brian Ahearn told reporters. The events that led to the law enforcement gunfire a block southeast of the Coronado Bridge began shortly after 7 a.m., when the suspect allegedly stole an electrical contractor’s work truck from a parking lot at the San Diego Convention Center, according to Ahearn. As the suspect, later identified as 32-year-old Jessica Turner of San Diego, was leaving the grounds of the bayside meeting-hall complex, the truck struck a golf cart being driven by an employee of the facility. The worker suffered no injuries in the collision, which caused minor damage to the smaller vehicle, the captain said. The suspect then drove off on Harbor Drive, tailed by another Convention Center employee and the auto-theft victim — both of whom were in a black pickup truck — and a harbor-police officer. At Cesar Chavez Parkway, two San Diego police officers caught up with the stolen Chevrolet and joined in the chase, Ahearn said. A short time later, after the suspect pulled several successive U- turns on Sampson Street, one of the SDPD officers — now in front of the suspect — pulled over and got out of his cruiser. The fleeing woman then allegedly drove the pickup toward him, prompting him and his partner to open fire. After Turner was taken into custody, medics took her to a hospital for treatment of apparently minor trauma she suffered in the solo crash of the stolen truck, the captain told news crews.